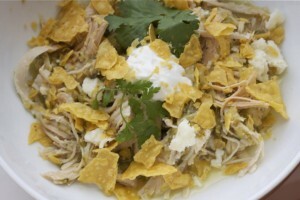 Turkey Verde is muy bien in a bowl with toppings or in a warm corn tortilla. She’d serve large parties her amazing slow cooked, spicy pork in green chile sauce. The guests would happily get in line with our tortillas ready to stuff, to eat and to get right back in line again. When my friend up and fled Sherwood for Utah (a very sad day indeed), I was lucky enough to get the recipe. The recipe originated from a 1967 cookbook, The Complete Book of Mexican Cooking, by Elizabeth Lambert Ortiz. The recipe was very exciting for me at the time. I simultaneously discovered nopalitos (cactus), tomatillos and coriander. Excellente. I’ve also found that the leftover sauce can be turned into a fantástico, citrus-infused green tortilla soup. In a food processor, mince together onion, garlic, nopalitos, jalapenos and cilantro. Pour mixture into a slow cooker. Place the turkey breast in the slow cooker (take off string if it is bound). Pour tomatillos and their juices over the top of the turkey and add salt and pepper. Cover slow cooker and cook on low for 10 hours. Remove turkey from slow cooker, and cut into bite size pieces. Return turkey to slow cooker and stir into sauce while breaking apart tomatillos. Serve warm with a slotted spoon into corn tortillas or into a bowl with tortilla chips. Add desired toppings like sour cream, cotija cheese, hot sauce, more cilantro, etc. Be sure to keep the remaining liquid & leftover turkey bits for some amazing tortilla soup. Warning: these are messy so lean over that plate!